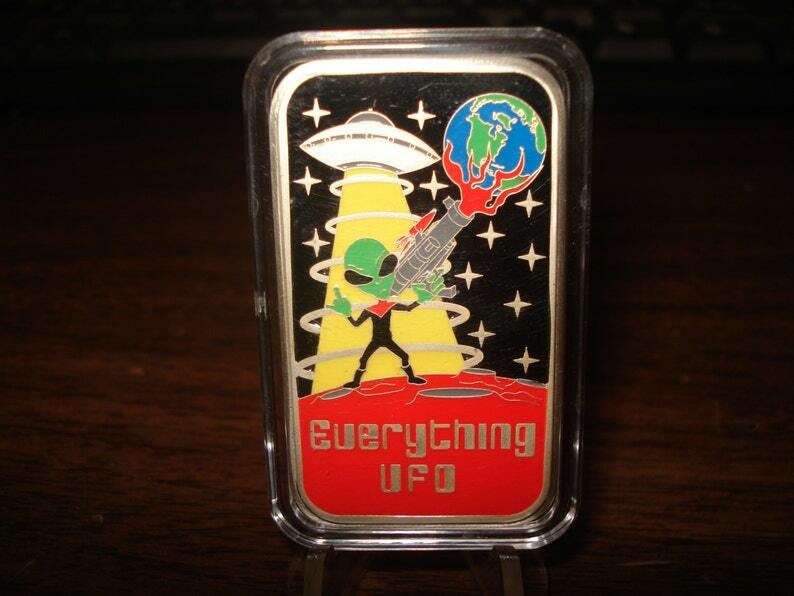 Every Thing UFO is Proud To Offer Enamel Bars Are Made by Master Die Maker from NWT.Each one is stamp by a State Of The Art Stamping Machine also each bar is grooved in metal to poured the enamel into the bar & bake for 12 to 14 hours for each color on the bar. They are not machine printed enamel bars like to you see everywhere like on eBay. ... These are professedly Hand done by craftsmen..... There about 12 to 15 hours that go into making each bars also they must be in a dust free environment at all time & are hand polish .... when you get one of these bars in your hands & compare these to other enamel bars you can see just how amazing these enamel bars real are. We are very excited to Offer you these Beautiful Hand Done Enamel Bars.They also come with COA & the bars are numbered 1 – 100 each Bar will have it own Serial Number 1 up to 100.The cost 85.00 each bar & shipping in USA. Important Serial Number will vary. you might get 15 or 27 or 99 all Serial Number will vary on bars.